In this Sept. 27, 2018, file photo Sen. Kamala Harris, listens to Christine Blasey Ford testify before the Senate Judiciary Committee on Capitol Hill in Washington, D.C.
First-term Democratic Senator Kamala Harris of California, a rising party star and outspoken critic of U.S. President Donald Trump’s immigration policies, launched her 2020 campaign for the White House on Monday by touting her background as a prosecutor. Ms. Harris, 54, the daughter of immigrants from Jamaica and India, enters the race with the potential advantage of being the Democratic candidate who looks most like the party’s increasingly diverse base of young, female and minority voters. She timed her announcement for the U.S. Martin Luther King Jr. Day holiday honouring the slain civil rights leader, saying he was an inspirational leader. 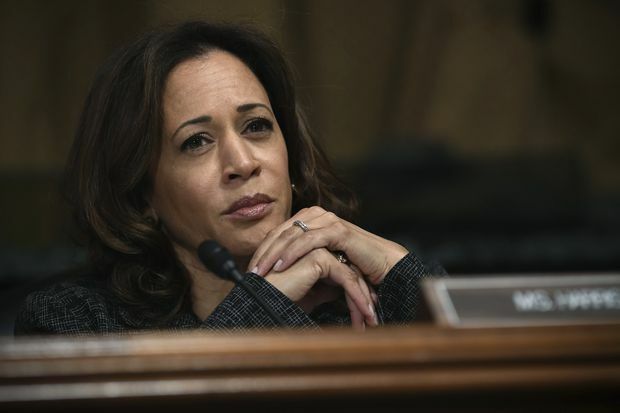 Ms. Harris, a former California state attorney-general, has become popular with liberal activists for her tough questioning of Trump administration appointees and officials, including Supreme Court nominee Brett Kavanaugh and former Attorney-General Jeff Sessions, during Senate hearings. Ms. Harris’s campaign will focus on reducing the high cost of living with a middle-class tax credit, pursuing immigration and criminal justice changes and a Medicare-for-all health care system, aides said. She has said she will reject corporate political action committee money. In the first 30 minutes after her announcement, Ms. Harris received individual online contributions from all 50 states, spokesman Ian Sams said on Twitter. The campaign will be based in Baltimore, about 64 kilometres north of Washington, with a second office in Oakland, Calif., where she will have a launch rally before the end of the month. Her slogan will be “For the People,” in a nod to Ms. Harris’s roots as a prosecutor, aides said. As one of the earliest congressional critics of Mr. Trump’s immigration policies, Ms. Harris has pushed hard for a deal to protect from deportation those immigrants who were brought to the country illegally as children, a group known as Dreamers. She is the fifth Democrat to enter what is shaping up to be a crowded battle for the nomination to challenge Mr. Trump, the likely Republican candidate. More than a dozen other Democrats are considering runs and CNN reported former Starbucks chief Howard Schultz is exploring an independent candidacy. The Republican National Committee criticized Ms. Harris as “the least vetted” of the Democratic candidates, calling her unqualified and out of touch. Ms. Harris, who made history in 2016 as the first black woman elected to the U.S. Senate from California, has embraced the party’s diversity ahead of a Democratic nominating campaign where minority voters and liberal activists are expected to have an outsized voice. The former San Francisco prosecutor drew notice when her rapid-fire grilling of Mr. Sessions during a 2017 Senate Judiciary Committee hearing caused him to complain. “It makes me nervous,” Mr. Sessions said. In September, she was among a handful of Democrats who aggressively questioned Mr. Kavanaugh at his Supreme Court confirmation hearing about his views on abortion and on the special counsel investigation of potential Russian meddling in the 2016 election. Ms. Harris started a book tour in early January to promote a memoir, making a series of media appearances that boosted her visibility ahead of her campaign announcement. In a memoir Ms. Harris describes the heartache of moving from Oakland to chilly Montreal so her mother Shyamala Gopalan, a breast-cancer researcher, could take a job at McGill University. By the time she was enrolled at Westmount, Ms. Harris had mostly adjusted to her life in Quebec, recalling fondly how her by-then divorced parents both attended her graduation, her mother resplendent in a bright red dress and heels. “We’re super happy, we’re super proud – we’re always happy when a Westmount grad does well,” said teacher Sabrina Jafralie, whose school counts songwriter Leonard Cohen, former Conservative cabinet minister Stockwell Day and prime ministerial spouse Mila Mulroney among its famous alumni. The kickoff state of Iowa has a strong base of liberal activists and the race will move quickly to more diverse states such as Nevada and South Carolina. Ms. Harris’s home state of California also has moved up its primary to increase its influence. Political foes will pore over Ms. Harris’ record in California, where some activists questioned whether she should have been more aggressive in pushing for changes to the criminal justice system. She also has come under scrutiny for declining as attorney general to prosecute OneWest, the bank once headed by Treasury Secretary Steven Mnuchin, for alleged foreclosure violations. Ms. Harris, who voted against Mr. Mnuchin’s confirmation as head of the Treasury, has said she “followed the facts” in declining to prosecute. She also has been criticized for saying she was not aware of sexual harassment allegations against one of her top aides, who resigned in December after a California newspaper asked him about a 2016 harassment lawsuit. Xavier Becerra, who replaced Ms. Harris as attorney general, settled the lawsuit in May, 2017, for $400,000.